Arthritis Dog Food Reviews: What is The Best Dog Food for Joint Health? » Arthritis Dog Food Reviews: What is The Best Dog Food for Joint Health? Arthritis is a degenerative joint disease that affects both humans and animals, causing stiff and painful joints. It is the number one cause of chronic pain in dogs and impacts approximately 20% or 1 in 5 adult dogs in the United States. There are several types of arthritis that can dogs can have, but osteoarthritis is the most common. The food your pupster eats can also impact on his joint health and mobility. A balanced diet plays a key part in leading an active, healthy lifestyle for dogs. Dogs with arthritis need a dog food that is specially formulated for healthy joint and bone health. Victor Performance Formula Dry Dog Food has high levels of USA-sourced proteins (83%), plus added Glucosamine and chondroitin to support long term joint health and alleviate pain, Omega-3's to reduce inflammation, fresh calcium and other vital minerals which a dog’s joints is starving for. Crude proteins (26%), crude fat (18%), crude fiber (3.8%), carbs (37.4%). As loving dog owners, we never want to see our furry friends in pain but unfortunately it can happen no matter how well we take care of our pets. If you happen to have a small breed dog the chances of them developing arthritis are slimmer than if you have a large breed, but environmental factors like injury and age also have a say in whether your dog will develop arthritis. Luckily, if they’re young there are things you can do to help reduce your dog’s chances of developing arthritis. One of the biggest things you can do is help your dog manage their weight through healthy eating and exercise. When your dog is a little older, the key becomes early detection. If your dog already has arthritis, there are some effective ways that you can treat it and help them live more comfortably. You might not realize it, but the food you feed your dog can make a big difference in more than just their appetite! Giving your dog high quality food with the right ingredients can help prevent arthritis or reduce the amount of pain that a dog with arthritis suffers from. The right formula should provide your dog with complete nutrition leaving little or no need for supplementation. Omega 3 & 6 Fatty Acids: From fish oil and flaxseed oil, to lubricate the joints and reduce inflammation. Glucosamine and chondroitin to strengthen and rebuild cartilage. Calcium to strengthen bone and help reduce the risk of developing arthritis. Vitamin D to help the body absorb calcium. Vitamin C to help rebuild connective tissues. Iron to protect anemia, a common autoimmune response in dogs with arthritis. Turmeric to promote healthy joints. High protein from quality meats, fish and eggs. Just like a proper diet can help our poor old furbabies with arthritis, a bad one can also aggravate arthritic pain. You should AVOID giving your dog foods that cause issues like excess inflammation, such as added sugar, dairy, salt, simple carbohydrates, corn oil, excess animal fat and artificial flavors, colors, and preservatives. It’s a good idea to choose food without a lot of grain that isn’t super processed and that includes most pet stores treats. Victor Performance With Glucosamine Dry Dog Food meets the levels established by the AAFCO Dog Food Nutrient Profiles for Adult Maintenance, meaning it offers complete nutrition for adult dogs. There are several things that make this hip and joint dog food a great option for any dog, but especially one with or at risk of developing arthritis. It has vegetables, glucosamine (900 mg/kg), chondroitin (250 mg/kg), flaxseed, Vitamin D, iron, and calcium. This dog food contains a lot of meat. Out of 26% total protein, 78% comes from USA-sourced chicken, beef, and pork. To ensure high quality, Victor uses four essential ingredients as the basis for superior pet nutrition and is made in their own Texas-based manufacturing facility. This food is great for active and sporting dogs and is formulated to support long-term joint health. 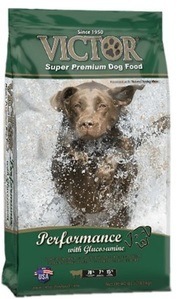 Pet owners are very impressed with the quality ingredients and nutrient levels in this food. Satisfied customers have shared how their dogs’ mobility improved or how their weight levelled out after switching to Victor from another brand. This high-quality food is cheaper than a lot of comparable alternatives, and since it is grain free and GMO free, owners can feel happy about feeding it to their aging arthritic dog. 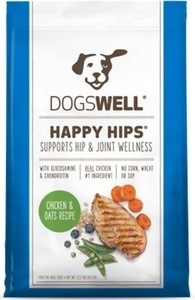 Dogswell Happy Hips Dry food is specially formulated to support hip and joint wellness. This chicken and oats recipe is made with real chicken as the first ingredient and is fortified with glucosamine (600 mg/kg) and chondroitin (300 mg/kg), which are known to help with joint problems like arthritis and hip dysplasia. Dogswell is a great company that donates to animal rescues and shelters across the country. If you are currently using expensive supplements to help your dog with joint issues, this dog food with glucosamine and chondroitin is more affordable and might just do the trick. Is has a couple of the important things mentioned earlier like flaxseed, fruits, veggies, iron, and Vitamin D. Also, this dog food doesn’t contain and corn, wheat, or soy, which are common culprits when it comes to problems like dog allergies and excessive weight gain. Owners of pets with joint issues are happy with this dog food. They say that it’s not only great for dogs with joint issues, but also works well with picky eaters and dogs with allergies. Dogs who showed some signs of arthritis like tiredness and limping improved after switching to this food. Owners with older dogs have said that this is a great way to make sure their dog is getting all the essential nutrients. 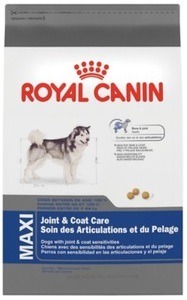 Royal Canin Joint & Coat Care dry dog food is made with glucosamine (750 mg/kg), chondroitin (25 mg/kg), and Omega 3 fatty acids to support dogs’ joints. This food is blended uniquely for large dogs also contains vitamins, minerals, and Omega 6 fatty acids to help protect your dog’s skin and promote a beautiful, healthy coat. Owners can trust this food for their dogs with arthritis or give it to their adult dogs as a preventative measure. This dog food is made with an exclusive formula that uses very high-quality protein and a balanced source of dietary fiber, which helps with dogs’ digestion. According to the company, this formula is made for adult large breed dogs over 15 months weighing 56-100 lbs who have joint and coat sensitivities. It also contains calcium, Vitamin C, and Vitamin D.
Royal Canin has been around since 1968. They’re a great brand because they know that nutritional levels vary between dogs of different sizes and make food that meets those needs. This food comes highly recommended by vets and dog owners who say that their dogs love this food. It doesn’t take long for the difference to show in your dog’s coat and it’s great for dogs with digestive issues or picky eaters! Another popular option with pet parents looking for the best dog food for joints and bones health. 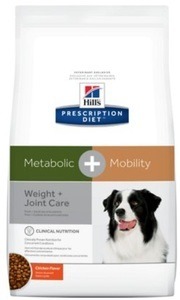 Hill’s Prescription Metabolic and Mobility Dry Dog Food offers chicken-flavored therapeutic dog nutrition for dogs with weight and joint problems such as hip dysplasia. Satisfied owners who have had this food prescribed by their vet have seen a difference in their dogs’ weight, mobility, and overall health. It contains some important ingredients like calcium, Vitamin C, and Vitamin D.
Compared to other similar foods, this one happens to be more expensive, and whether you’re willing to pay that price depends on if you think that this food works better than the rest. Usually this type of dog food is prescribed by vets, where it tends to be a little cheaper (but you pay for the vet visit). AAFCO states that this food provides balanced nutrition for adult dogs but should only be used as directed by your veterinarian. According to customers, this food is high quality and good for picky eaters but pricey. Unlike other hip and joint dog food, this one doesn’t state how much glucosamine and chondroitin is in the formula but the reviews and the rest of the ingredients provides the nutrition required to reduce the progress rate of hip dysplasia and other types of arthritis in dogs. One of the main causes of arthritis in dogs is age. As dogs get older there is natural wear and tear on the body, an arthritis is one of the consequences. Other causes of arthritis in dogs include things like obesity, chronic illness, injury, hip dysplasia, and abnormal stress of the joints. This kind of stress on the joints should be avoided, especially in puppyhood, when the joints are still developing. An example of abnormal stress could be too much running on pavement when the dog is too young or jumping from too high onto a hard surface. When it comes to arthritis in dogs, one important thing that you can do as an owner is to know and always be on the lookout for symptoms. This might not be too important when your dog is a puppy but will be very important as they start to get older. When a dog first develops arthritis, the changes can be subtle. Detecting them early can make a pretty big difference. licking, chewing and biting the areas that are sore. If you have an adult dog and you start to notice one or more of these issues, it’s important to get them looked over by a vet. You may think that tiredness or limping on their own might not be a big deal, but early detection is important for improving quality of life for dogs with arthritis. If you’re lucky, you’ll get an inexpensive visit to the vet and an all-clear for your dog... it’s just better to be safe than sorry! What dog breeds are prone to arthritis? Large breeds and obese dogs are more prone to developing arthritis than smaller dogs. Golden Retrievers, German Shepherd, Labrador Retriever, Rottweiler, Afghan Hound, Newfoundland, Bulldog, Old English Sheepdogs, American Staffordshire Terrier, Mastiff, Great Dane and Saint Bernard. Even though larger dogs are more prone to developing arthritis, some smaller breeds can have a higher likelihood of getting the condition, like Pugs and French Bulldogs. No matter what size dog you have, Messonnier made a good point when he stated in the The Natural Vet's Guide to Preventing and Treating Arthritis in Dogs and Cats, that “Purebred dogs should be screened early in life for the presence of congenital problems that cause disease later in life.” This is because some congenital problems might mimic the symptoms of arthritis but not really be it. Arthritis in dogs is commonly treated with supplements such as glucosamine and chondroitin sulfate. These supplements cannot heal structural damage, but they do reduce inflammation and help repair and strengthen joint tissues. In many cases where the arthritis has not progressed too much, these supplements can make a big enough difference to put off having to get riskier treatments like surgery. Other treatments that can improve the health of dogs with arthritis include steroids, NSAIDs, pain relievers, physical therapy, weight loss, surgery, and acupuncture. More on the subject of weight loss, dogs are meant to be lean. If your older dog is suffering inflammation in their joints then they REALLY need to be lean to minimize the impact on their joints and make sure they last as long as possible. If you feel your dog is a little on the heavy side please check out the article on obesity in dogs which will help you get it under control. 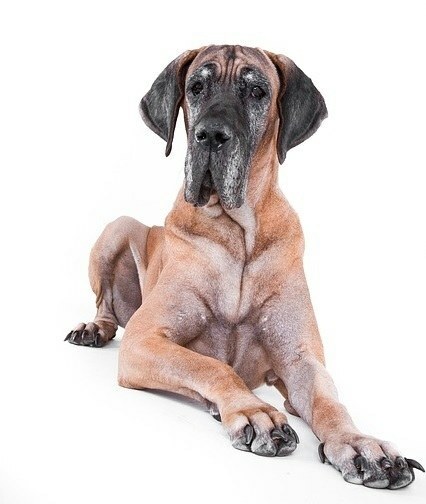 Can premature arthritis occur in dogs? In most cases, arthritis develops later in life just like with us humans. However, the issue can ALSO start early on, even when your dog is only 3 or 4 years old and the pain can range from discomfort to debilitating in younger dogs just as much as in senior dogs. An early onset of arthritis can leave dogs “deformed” or disabled if left untreated or not properly diagnosed. What natural remedies can I give my dog for arthritis? Supplements are natural remedies for arthritis that are safer and have fewer side effects than many drugs used to treat arthritis in dogs. Alone or alongside other treatments, these natural remedies can improve a dog’s comfort, but be aware that they may take some time before they start to work and can be expensive. Cod live oil: This supplement benefits from lots of beneficial omega 3’s which will lubricate stiffening joints. You can add cod liver oil capsules to their dinner. You can either choose the capsules or go for the best source of omega 3 - raw, fresh whole sardines. Two sardines a day will suffice. Glucosamine, Chondroitin & MSM: Chondroitin has been seen to be effective at alleviating joint pain, glucosamine less so but still efficient. A couple of these supplement brands include Deley Naturals and BiologicVET. Golden Turmeric Paste: Quite a common and POTENT home remedy in treating arthritis in dogs. It's possible the strongest natural anti-inflammatory out there and can be easily made from home. Green lipped mussel: There is hard evidence that this proactive supplement is effective at both treating AND preventing arthritis in dogs. It's reasonably priced and readily available at Amazon. CBD rich hemp oil products: Studies show that CBD helps reduce pain from arthritis and normal wear and tear, and may just add a little more pep in your dog's step. Turmeric is a powerful aid for any animal or human suffering from arthritis. Add the ground spice to their food or add capsules to their dinner. GlycoFlex, for arthritis in dogs, is a highly popular vet-recommended joint supplement. It contains all the supplements mentioned above (omega 3, green lipped mussel, glucosamine and chondroitin) but in a handy and delicious soft dog chew. 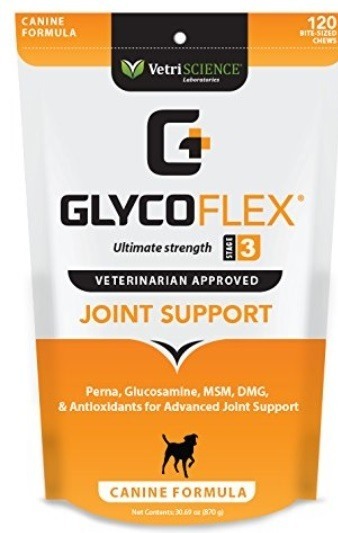 GlycoFex also contains a few other ingredients such as Vitaease (which is a fancy way of saying they included vitamins such as vitamin C & E which are known to support joint fluidity) and other minerals pertinent for dogs with limited mobility or dogs in recovery after orthopedic surgery. It’s great stuff. If you’re worried that your dog or a dog you know is developing arthritis, the good news is that it’s a manageable disease especially when it is caught early on. 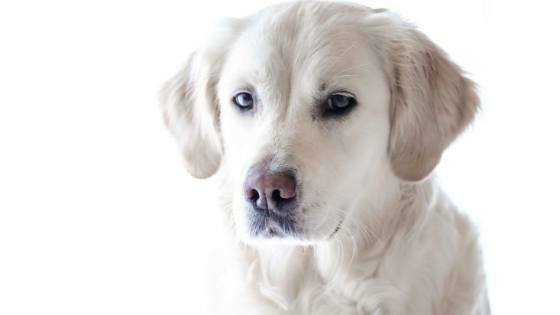 Dogs can still live a long and happy life with arthritis, if it is taken care of. How long a dog can live with arthritis is not exact. It will depend on several factors like the root cause, if they are receiving treatment, and if they have any other illnesses. What other lifestyle changes should you do to help your arthritic dog? The pain resulting from arthritis is probably worst after periods of inactivity, however it gets better with movement. As the pain grows, your dog will move less, exercise less, and unfortunately go downhill faster. To AVOID the reduction in mobility and stiff limbs and backs - a little and gentle form of exercise goes a long way. Keeping active will help to strengthen your dog’s muscles – and those muscles can help stabilize and support joints. Avoid ANY kind of strenuous playtime and allow for plenty of rest time and snoozes. A weekly swim (hydrotherapy) can help free up the joints, loosens the tension around them, maybe eventually helping to rebuild the muscle around the joint and stabilizing it. Acupuncture helps muscles relax allowing the blood and energy to flow back to areas where it may have been restricted from. Since dogs with arthritis rest a lot, a very comfy and supportive dog bed complete with pillows, fluffy blankets and their own warm cover is a must. Be sure to check with your vet that your pup is okay with these exercise & alternative therapies - he may recommend starting with a canine physical therapist for adding body conditioning training. How to help a dog with arthritis at home? Feeding your dog high quality food and doing your best to help manage their weight are two main ways that you can help your dog with arthritis at home. Another way involves making sure that they get regular exercise. Their exercise should be in a controlled environment and preferably take place on a soft surface like grass or carpeting rather than a harder surface like cement. Follow your dog’s treatment plan to ensure that their pain is managed and try to maintain a low stress environment with plenty of affection. To keep your dog with arthritis as comfortable as possible, they should stay warm and dry and have soft supportive betting. The idea is to create a safe and consistent environment where the condition will not be exacerbated unnecessarily. 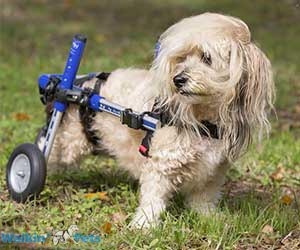 If needed mobility aids like a rear or full support dog wheelchair, splint, or support slings can help your dog get around when it starts to get more difficult. Other ideas for helping your dog with arthritis around the house include ramps for getting into the car and bed or carpeting and rugs for traction in areas where your dog hangs out the most. Living with arthritis pain is not fun, which is why as pet owners we hope that our dogs won’t develop it as they age. However, one in five will so it’s best to be prepared. The best way to prevent arthritis in dogs is to maintain their weight and overall health. One good way to do that is by providing your dog with balanced nutrition (and making sure they get enough exercise, of course). Out of the four brands reviewed here that are known for being good for dogs with arthritis, the one that stands out the most is Victor Performance. This food is great because owners have seen improvements in their dog’s weight and mobility after switching to this food. Victor Performance with Glucosamine has great ingredients and nutrient levels, plus it’s affordable compared to other brands with similar quality. Once you choose a food that works for your dog, another thing you can do to monitor for arthritis is make sure they get regular visits to the vet. If your dog is diagnosed with arthritis, its important to follow whatever treatment plan you and your vet come up with. You can also do small things like buying your dog a soft, padded bed to sleep on, so they’re kept as comfortable and pain-free as possible. Just remember, a diagnosis of arthritis is not the worst thing that could happen for your dog. With the right attitude on the part of their owners along with diet, exercise, and lifestyle changes it is possible for dogs to live long and happy lives even with arthritis. on Joint Health Dog Food!